Olympic champion Adam Peaty has ruled out a bid for two individual gold medals at Tokyo 2020 and will focus on defending his 100m breaststroke title. As the 50m event is not in the Olympic programme, Peaty had suggested he could boost his medal prospects by adding the 200m to his schedule. But he has now decided against that and will not race the event at this week’s British Championships. 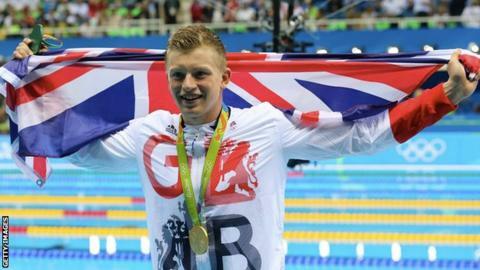 “I want to focus on pushing the boundaries in the 100m,” Peaty said. The 24-year-old was considering racing in the 200m breaststroke at last year’s Commonwealth Games in Australia but withdrew before the event and has now abandoned any thoughts of racing it at major competitions in the future. “If you look at the 200m swimmers they’re all kind of skinny and long in their stroke and I’m the complete opposite,” the five-time world champion told BBC Sport. Peaty holds the world record in both the 50m (25.95 seconds) and 100m (57.10 seconds) breaststroke events and hopes to achieve his long-term ‘Project 56’ target – beating the 57-second mark – in the 100m within the next 18 months. “I’ve changed my mindset and don’t really talk about ‘Project 56’ now, but it’s looking nice,” he said. Two years ago, legendary American swimmer Mark Spitz – who won seven gold medals at the 1972 Olympics and excelled in multiple distances and events – told BBC Sport he felt it would be a “risk” for Peaty to race over 200m. “If he’s in condition for the 200m breaststroke then he’s not going to be as good at the shorter distances,” Spitz said. The British Swimming Championships, which run from 16-21 April in Glasgow, serve as the qualification event for this summer’s World Aquatics Championships in Gwangju, South Korea.